It's pretty simple with Orrville...they need to take care of the ball, and play sound defense. Lately, both of those things have happened as the Riders haven't turned the ball over once since the 2nd half of the week 9 game against Clear Fork...so they're working on 10 turnover-free quarters of football. Penalties are down too...two things that were hallmarks of this team in the early part of the season. If the Riders can get a few early scores and lean on their defense to slow down the Bobcat attack, I think the night goes well for Orrville. The Riders will look for seniors Mason Monheim, Stewart Turner and Drew Brenner to lead the way. Brenner has filled in well for injured junior Kyle Lichti in the quarterback department. Turner is a game changer anytime he's on the field of play....his game against LaBrae last week was what Orrville fans have been spoiled with since he came to Orrville two years ago....he had an interception, a long receiving touchdown and several nice punt returns. Monheim is steady as they come from his RB and LB positions. Closing in on 500 tackles, he'll no doubt keep an eye on Norwayne QB Adam Wallace. All three are gamechangers and playmakers. The Bobcat's success may live and die with what Adam Wallace is able to do on both sides of the ball. From his quarterback spot, Wallace can throw to a talented core of receivers or he can escape the pocket and pick up yards running the ball. He'll also anchor the Bobcat defense and look to stuff the Orrville run game. The Norwayne receivers are a solid bunch and may present the most well-rounded group of wideouts the Riders have seen this season. If Wallace can find them in space, they have the size to make plays and pick up yards in chunks. The Zimmerly brothers at running back present another option for Wallace, and I think it will be important for at least 1 other running threat besides Wallace to make an impact on offense for Norwayne. I think it's important for Norwayne to get off to a hot start. 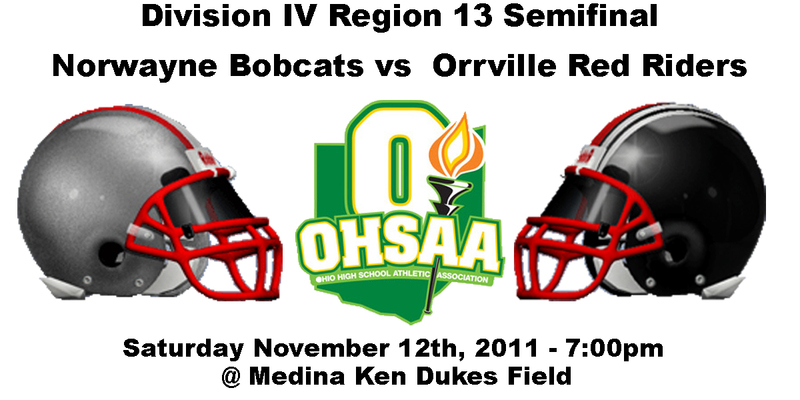 An early score will get their crowd in the game and also boost their confidence that they can hang with Orrville. The Rider defense has given up the first score in each of their last 3 games, but have settled down in each and wore down the opposing offense as the game progressed. The Bobcats need someone else to step up besides Wallace or the Rider defense will key on him and no one else. On defense, the Bobcats need to guard against the big play by Orrville's playmakers. If they can make the Riders have long, sustained drives, their chances for stops increase immensely. For the Riders, stopping Adam Wallace will be key on defense, and I think the Riders have plenty of talent on defense with which to do that. The Rider defense line led by senior nose guard Trevor White will look to chase Wallace from the pocket and make him throw the ball under distress. On offense, the Riders need to continue making effective choices and diversifying their options. I think receivers Cody Weaver and Alex Samson could make a big impact as the Bobcat D focuses on Turner. If the Riders can get consistent gains from Brenner and Monheim, the Bobcats will be forced to load the box to stop the run and that will open the passing game for the Riders. There's so much more that we could talk about, but I just want this game to happen, so I'm going to let the kids do the talking on the field. 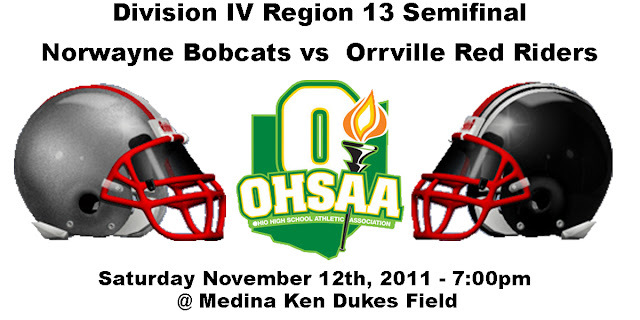 Can't wait to see the turnout in Medina for this showdown...and I think in the end, the Riders athleticism, size and skill players are enough for them to post a 27-14 victory and earn a 3rd straight regional championship berth.